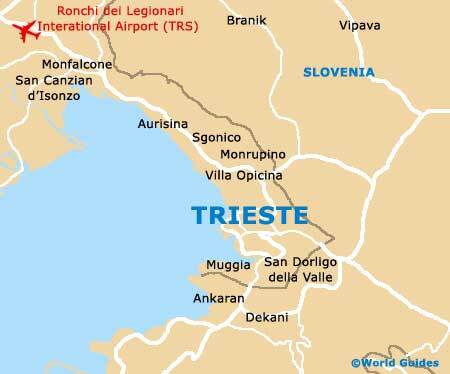 The city of Trieste lies at the very edge of north-east Italy and is sandwiched by both nearby Slovenia and also the Adriatic Sea. 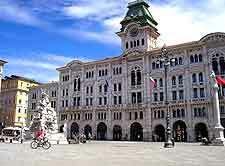 Trieste is amongst Italy's most unique cities and Mediterranean resorts, and much of its former grandeur is still clearly apparent in the form of imposing buildings with elaborate Neo-classical facades. Today, Trieste is often wrongly overlooked by tourists who choose to visit the more well-known Italian cities and their highly developed tourism infrastructures, such as Venice (162 km / 101 miles to the west). With its many cultural attractions, quality museums, endless coffee shops and ancient Roman remains, Trieste is also the perfect base for those wishing to explore this coast and its many gems, such as the Castello di Miramare. Many of the best sightseeing in Trieste is to be found within the medieval quarter of the Old Town, and also within the New Town district, which is otherwise known as the Borgo Teresiano and is home to the Canal Grande. The Basilica di San Silvestro is one tourist attraction hard to miss, since it stands atop the Colle Capitolino hill. Dating back to the 14th-century, Trieste Cathedral is equally impressive and to be found presiding over the Piazza della Cattedrale. Families always enjoy visiting both the Civic Acquario Marino (Aquarium) and the spa centre of L'Ausonia. 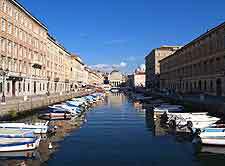 More information about Trieste Tourist Attractions. 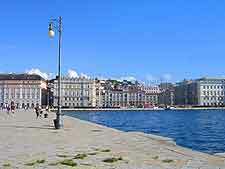 The city's harbour is amongst the main landmarks within Trieste and always a hub of activity, as is the Piazza dell'Unità d'Italia, an enormous square edging the seafront and home to the Town Hall. For something a little more historic, Trieste is well known throughout Friuli-Venezia Giulia for its Roman amphitheatre, which was built some 2,000 years ago, while for some of the best views across Trieste, climb the 200 steps to the top of the Victory Lighthouse. More information about Trieste Landmarks. It may be true that Trieste is a relatively small and compact city, but its wealth of history has resulted in a good selection of museums, filled with information about its long and interesting past. The main museums include the Museum of the Sea, where the city's once thriving port is remembered, and also the Joyce Museum, which celebrates the life of local writer James Joyce. Built into the actual hillside, the Speleovivarium Science Museum is worth considering in Trieste. Other tourists may prefer a visit to the Museum of History and Art or the Revoltella Museum, where many fine paintings can be viewed. 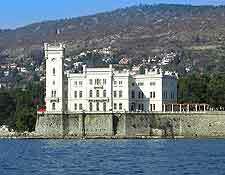 More information about Trieste Museums and Trieste Art Galleries. 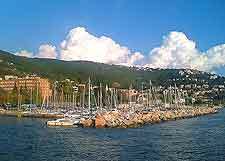 Tourists will soon realise that Trieste is actually a very good base should you wish to explore this part of Italy further. Close by are a number of enticing seaside towns, such as Muggia and also the resort of Grado, where the fine sandy beaches are extremely scenic. The coastal town of Lignano is conveniently part way between Trieste and Venice, and is also near to the rather spectacular Marano Lagoon. More information about Trieste Attractions Nearby.